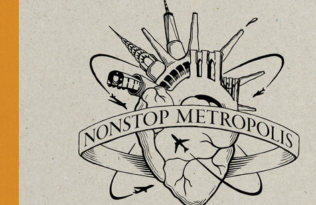 We are excited about the forthcoming publication of Nonstop Metropolis: A New York City Atlas, the final volume in our trilogy of atlases by Rebecca Solnit, Joshua Jelly-Schapiro, and a host of notable contributors. Following the publication of the critically lauded Infinite City (San Francisco) and Unfathomable City (New Orleans), we bring you this homage—and challenge—to the way we know New York City, an exquisitely designed and gorgeously illustrated atlas that excavates the many buried layers of all five boroughs of New York City (and parts of New Jersey!). With this inaugural post, we launch a weekly series to bring you inside the books, share the process of creating them, and announce news, reviews, and events. Enjoy! We think you will appreciate it as much as we do! Our inspiration for this map was the art of Tino Rodriguez, a perpetual metamorphosis in which humans grow wings and breath takes the form of a bird and men’s bodies as well as women’s can be tender, flower-bedecked, mortal, carnal, spiritual—a world in which nothing is separated by category or species. His paintings are reminders that the natural world comes right into the city and asserts itself in a lover’s bouquet, a funeral wreath, in the ways animals furnish our imagination and the animals we catch sight of lift our spirits or break us out of our routine. This is a map about the forces that break the routines of the city, about the dissident forces that are in some ways life itself—life that existed before the orderly city of authority, outside it, despite it, and will live after it—forces that include saints and lovers, humans and animals, birdwatchers and nightclubbers. 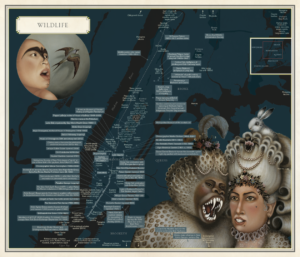 Nonstop Metropolis conveys innumerable, unbound experiences of New York City through 26 imaginative maps and informative essays. Preorder your copy today.